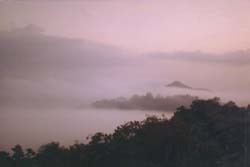 Our 1500 acre rainforest preserve in Costa Rica at 5:00 am. What you can't hear are the howler monkeys as they bark out their reservations for a continental breakfast across the valley. A two-year old pillow tree (ochroma lagopus). We found hard to foresee the size of this specimen when we first planted the seeds. When you rub the gigantic leaves together, you get an odour of peanuts. A lucky shot taken on Tierra Buena...while surveying the property we came across the half-eaten carcass of a small pig. Not far away, we spotted this ocelot. I managed to get 20 feet downwind, crawling on my belly to get this shot with no zoom lens. The ocelot, a female, picked up my scent and with a hiss she was gone. The piglet belonged to a local farmer who was a little perplexed at his loss. A small gift set things in a lighter vein. 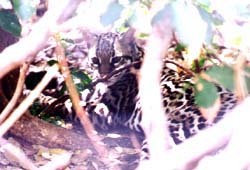 As for the ocelot, she's still out there, doing what she does best. 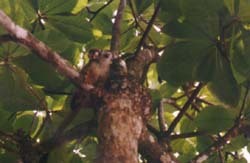 A squirrel monkey and offspring in a Guave (cocktail) tree. 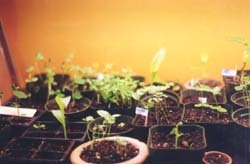 Seedings growing in Toronto in December under a gro-lux bulb (available at any hardware store). 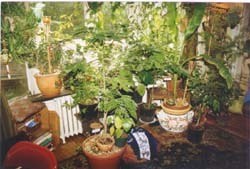 A papaya tree (front) and a jungle banana tree (background), facing east. A four-year old papaya tree (carica sp.) which my wife grew from seed. Each spring we bring it out onto the deck where it's shaded by a big oak tree. It flowers every August. Indoors, we keep it in a sunlit east room where it stands to the ceiling (12'), but we manage to trim the root to keep it to its proper size. This section will change to reflect seasonality. Stay tuned!